No Return or Exchange But Still 100% Guaranteed! This collar is made to fit most adult Shar Peis. So just measure your dogs neck and confirm that it fits within the range below. No need to worry about selecting a size! Choose your colors, enter your custom text, add an artistic icon, and we'll take care of the rest. Personalized Blue Daisy Dog Collar Made in the USA by Yellow Dog Design, Inc. 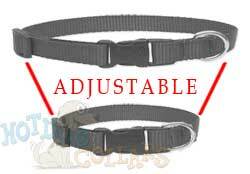 This dog collar utilizes a quick clasp closure, also called a side release clasp. Sizing is given as a range of neck lengths. Measure your dogs neck size or its current collar length (not including buckles) to ensure correct sizing. The text and art will not come off the collar, guaranteed! Pre-sized to fit most adultShar Peis!